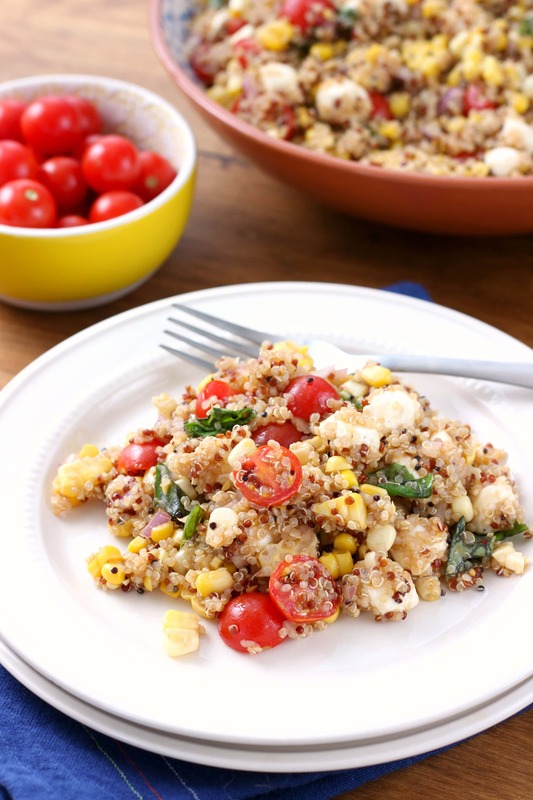 Juicy tomatoes, creamy mozzarella, and fresh basil combine with quinoa to create this fresh, flavorful summer caprese quinoa salad that’s both healthy and filling! An additional burst flavor comes from fresh summer sweet corn! Summer’s not over yet! With all of the fall recipes popping up and with as many cans of pumpkin as I’ve gone through in the last couple of weeks, you might think it’s already fall. However, summer is still here, and I’m not ready to give up all of the fresh produce from my garden quite yet. Our tomatoes are going crazy, and our basil plant is a little out of control! 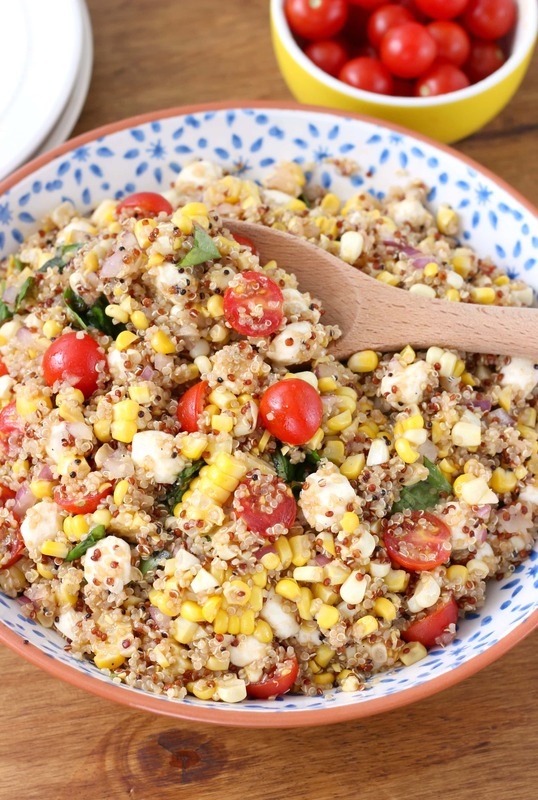 In order to not let any of it go to waste, we recently made this caprese quinoa salad with fresh sweet corn. 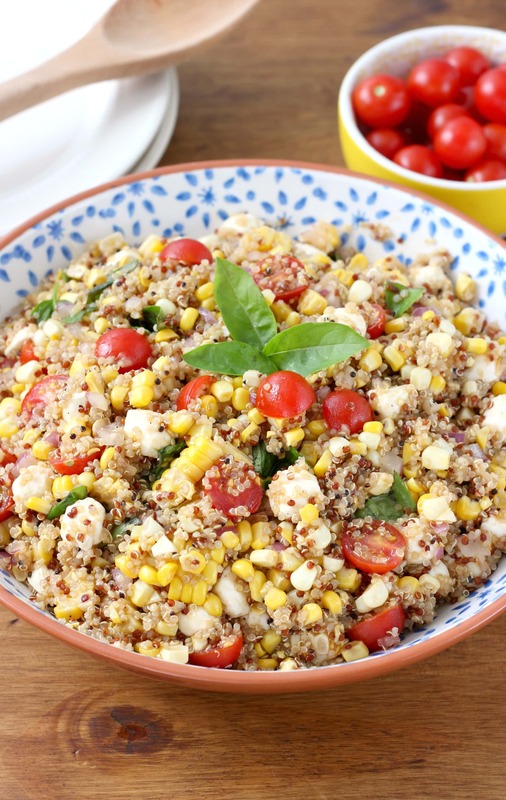 Based off of our fresh corn and tomato pasta salad, this caprese quinoa salad uses the same dressing, but swaps out the pasta for quinoa and adds a good amount of fresh torn basil! Also, fresh mozzarella pearls take the place of the feta adding to the overall fresh flavors in this salad. We both agreed that this salad needed to make an appearance again before summer is over. We’ve eaten it as a meal by itself or with some shredded chicken (Rotisserie chicken works well if you’re in a hurry!). Both ways are filling and super easy! This salad is perfect for busy weeknights. The longest step is cooking the quinoa! 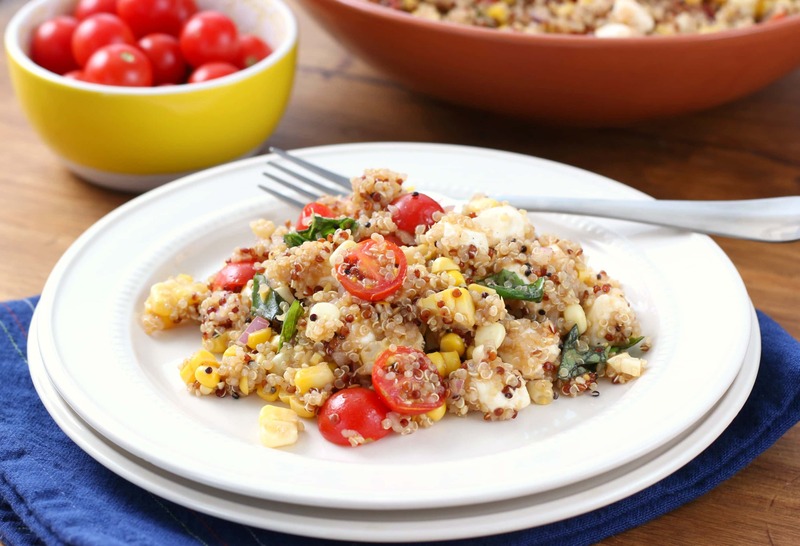 If you’re still clinging to the last days of summer, savor it even more with this quick and easy caprese quinoa salad! In a small bowl, whisk together all ingredients for the dressing until well-combined. Pour over quinoa and stir until quinoa is completely covered. Stir in corn, cherry tomatoes mozzarella, basil, and red onion until combined. I wish the tomatoes in my garden would get with the program because they’d be perfect in this end of summer salad. Looks delicious! The sweet corn is money! Oooh, this looks incredible!!! I have to make it ASAP.